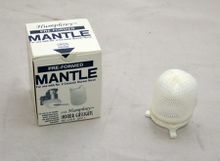 Pre-formed mantle replacement for Humphrey indoor gas lights. Use with L12-2A burner nose on all series 9 gaslights. Fits most standard indoor/outdoor gaslights.